Hello! It's Lorraine here with a card challenge! Today the challenge is a simple one. Thanks to Pinterest, I was playing with an old technique, while I was watching "Vikings" on tv. I looked up and saw a scene where the colors in a misty forest were breathtaking. I tried to recreate that color scheme with my distress ink pads and was pleased with the serene look I achieved. The technique is simply to pull your ink pad across the panel. I used Tim Holtz Distress Inks - Hickory Smoke, Peeled Paint and Iced Spruce. Then I stamped with the Tim Holtz stamp "A Tree Line" with Jet Black Archival Ink. I used the primary inking of the stamp and then offset as second generation stamping slightly behind the first, then wrapped a length of twine on the bottom. Thanks for looking in today. 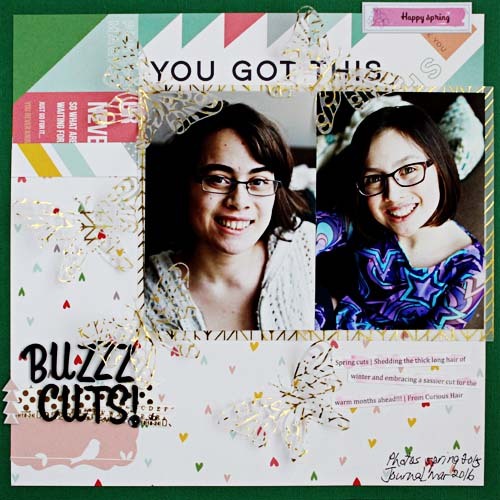 We have card challenges bi-weekly on Scrapshotz and we'd love to have you join in! Hello! 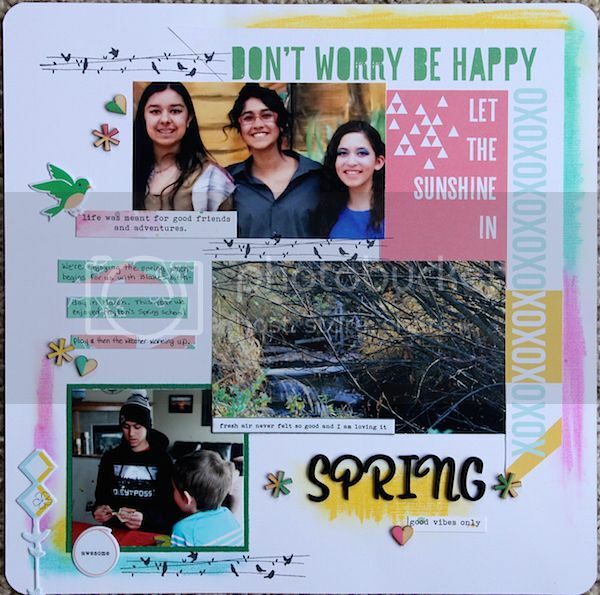 It's Lorraine with a layout tag from March to share with you. Here's the scoop. We start with a layout from the Scrapshotz gallery, create a layout, then pass it along, tagging the next in line. It's fun to see what inspires different people. If you scroll through, you can usually see what inspired the next layout, whether it was color, design or even topic. We've started another layout tag, and there is still time to join in the fun. Here's a link to the forum where you are more than welcome! Challenge Yourself - April LO Tag or let me know in the comments and I'll hook you up! Thanks for looking! ;) Have a great day! Rosie here to share with you my projects created using the Scrap Shotz March kit featuring the Felicity line by Pinkfresh Studios. 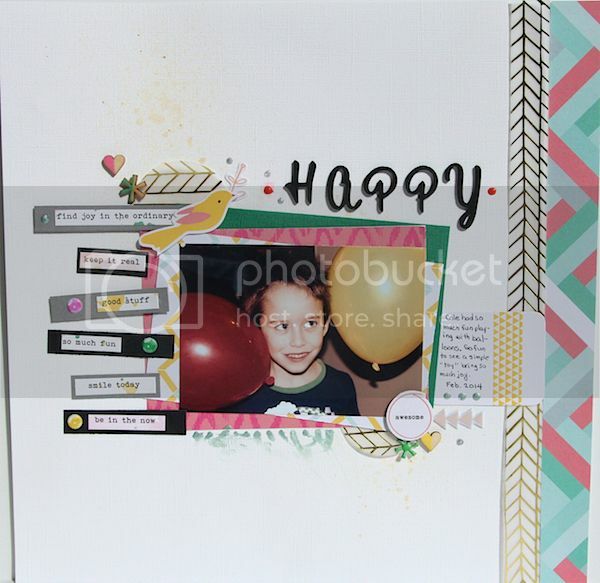 This kit is packed with fresh, bright and happy feeling prints along with some fabulous word stickers, wood veneer, puffy stickers, foam alphas and a beautiful piece of gold chevron vellum. I also used the Felicity Die cuts add-on. This was one of my most favorite papers in the Felicity line, okay who am I kidding...I love it ALL! This layout came together very quickly as I knew I wanted to focus on this fabulous herringbone pattern. 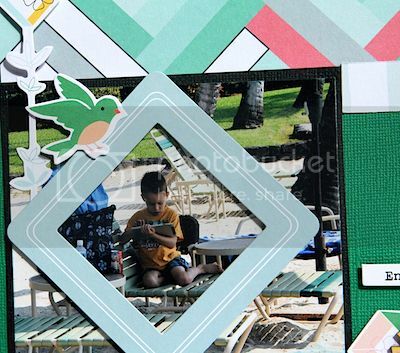 I echoed the angles in the paper by turning the square die cut frame on an angle. 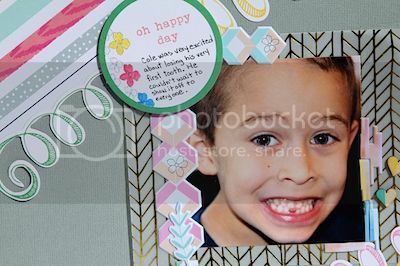 The die cut frame is popped up over the part of the photo I want the focus to be on which is an easy way to "crop" your photo without making it teeny weeny. The "Enjoy the Little Things" sticker is also popped up along with the tall sticker on the left hand side. I thought the little green birdie was a nice accent on the frame as it matches the green cardstock, such a beautiful shade of green. 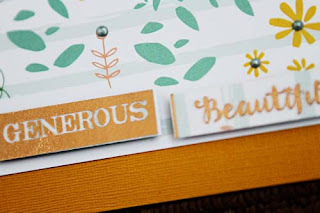 The die cut tag holds my journaling and the wood veener accents finish the layout off. I often create a layout based on how it "feels" when I start laying down paper and photos. 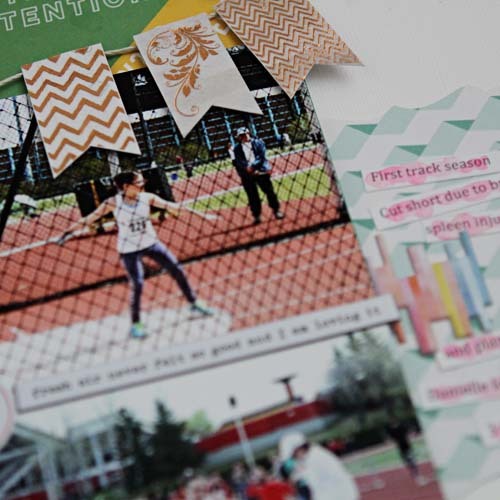 I chose the photos first for this layout and shuffled the papers around until I found a couple that "felt" right, in this case the grey and multicoloured paper along the bottom and a small heart print at the top that I've overlayed the gold vellum on. While putting away the flowers I stamped and coloured in Vicki Boutin's Distress Water Colouring class, I noticed that the colours and flowers "felt" tropical and would work perfectly on this layout. Vicki kindly loaned me her flower stamps so I stamped the images on Ranger-Inkessentials Specialty Stamping Paper and water coloured with Tim Holtz Distress Inks. If you'd like to know the exact colours I used, please leave a comment and I will list them for you. I then fussy cut the flowers, moved them around until I liked the positioning and popped a few up with pop dots. The flower centers are done with Nuvo glitter drops and I've added the puffy sequin stickers for more visual interest. The layout began with this scrap piece of the diagonal striped paper, I actually added the pink/red paper in between the dotted and aqua stripes. Scraps of the gold vellum became the photo mat and a border along the top and side of the diagonal stripes. The swirly die cuts lead the eye towards the photo. I've created a partial frame around the photo with the puffy stickers, layering them on each other and even cutting apart one of the stickers and laying alongside the middle-bottom right of the photo. 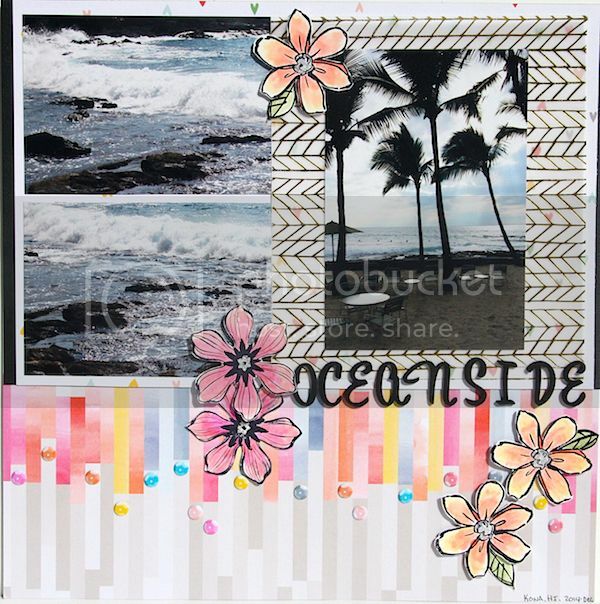 The journal die cut does double duty as the layout title and, of course, journaling spot. I've coloured in the flowers on the die cut with Wink of Stella markers. The die cut houses anchor the diagonal design in the bottom right hand corner. 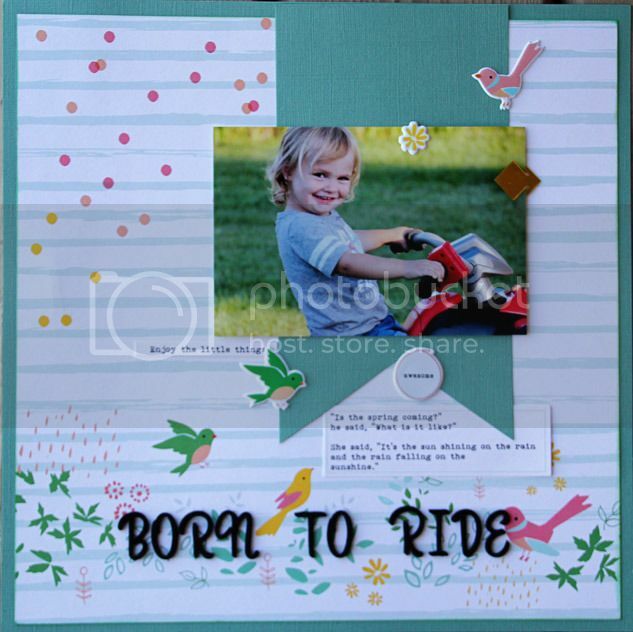 This is another layout utilizing scraps from the other projects I created. The long strips along the right side, triple offset photo mat, punched circles and card stock sticker mats are all from leftover scraps. A spritz of gold glimmer mist in the top left and bottom right corners adds some interest to the white space along with a sprinkle of wood veneer, popped up die cuts and faux enamel dots using Nuvo glitter and pearl drops. You'll notice the green "swipes" under the photo mat, my son came over to admire his photo and smudged the Nuvo drops before they dried, I'll call it added texture to the layout ;). This was a super simple card to make, I fussy cut a piece out of the pattern paper and coloured in some of the flowers with Wink of Stella markers. 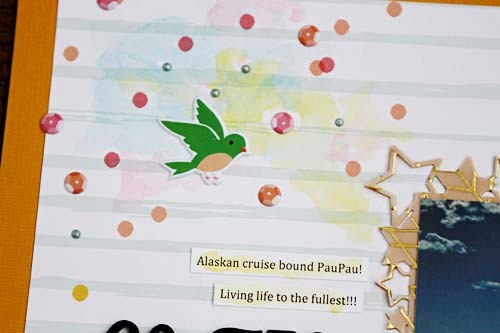 The sticker became the card sentiment and then a few puffy sequin stickers finished it off. 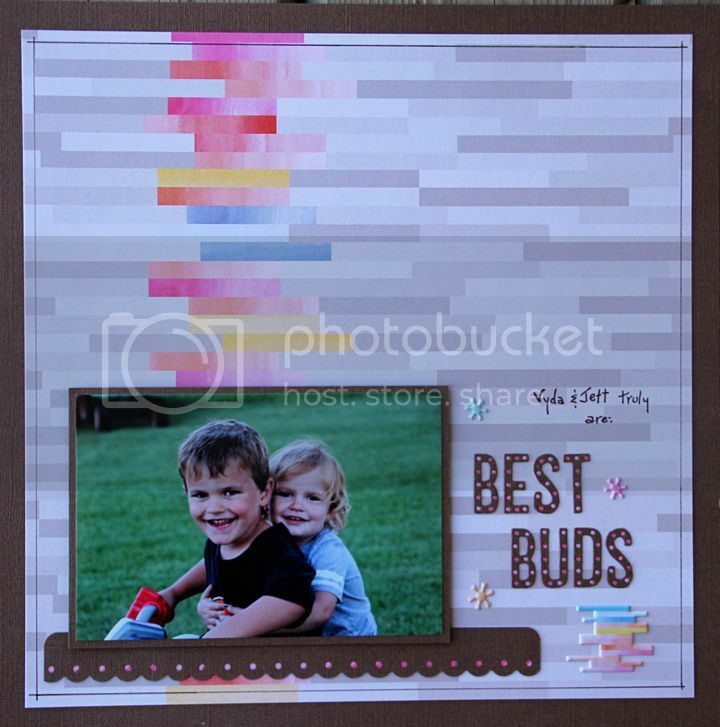 Another project using up scraps, the card background is the diagonal striped paper. 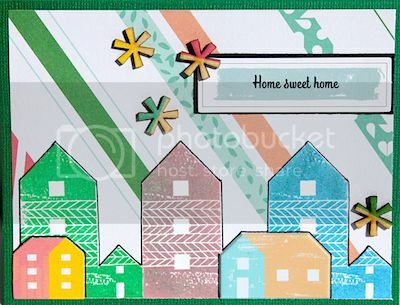 I have stamped the large houses with the kit add-on stamp. The small houses are a die cut and a puffy sticker. I then outlined the houses and the sentiment to make them 'pop' off the background. A few wood veener pieces finish off this housewarming/new home card. 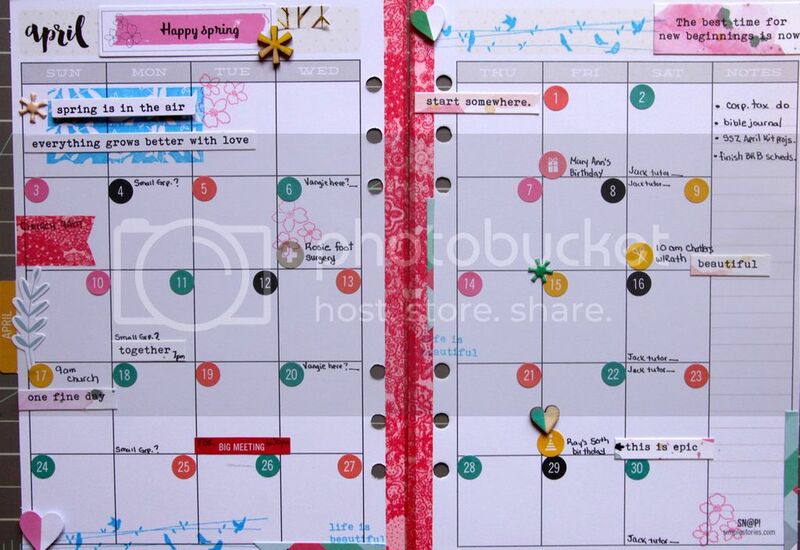 I just began using a Carpe Diem planner this year and wow I have seen some gorgeous planner spreads on Pinterest. I keep my planner fairly simple, so far anyway ;), I know I won't use it if I try to make it a uber creative activity as opposed to helping keep track of appointments, etc. I spend a bit more time with adding pretty stuff on the monthly spread and you can see here I used the Felicity stamp set the most. I've added some of the card stock stickers along with a few of the smaller die cuts that fit the scale of these pages well. I created long, thin horizontal flags along the photo block instead of the vertical flags in the sketch. As the flags are layered on an angle over each other I popped up a sticker over the meeting point to hide the meeting point. For some reason I can't seem to see an ampersand and without thinking it needs to be in a title. I never seem to be able to come up with one and I couldn't think of one for this layout either so I used it as an accent to layer the flags over top. 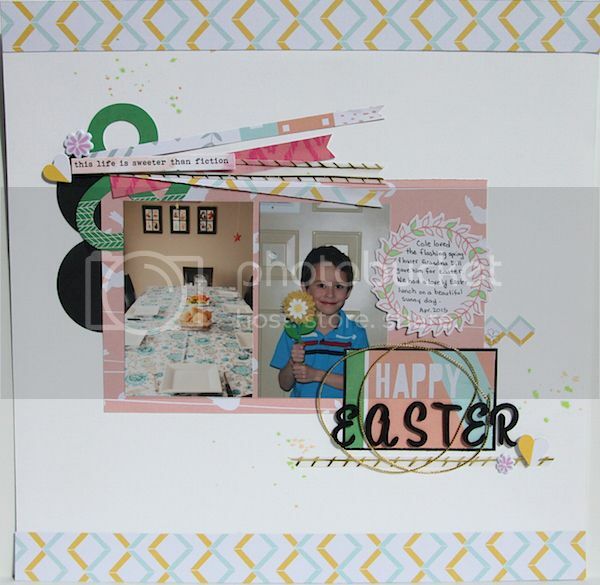 This title is a journal card that I cut down to fit the space, matted on black card stock and added 'easter' out of the kit alphas. I really liked the circular element around the title on the sketch so I used a bit of Stampin' Up gold cord around the alphas. Some die cut pieces, stickers and a few drips of Tim Holtz distress spray finish off the layout. Thanks for taking the time to pop in and peruse my projects, I've hope you've enjoyed all of our projects and getting some insight in to how they came together. Keep popping in as we've got lots of great stuff planned for the blog. Scrap Shotz March 2016 Kit Reveal - Pinkfresh Studio "Felicity"
This was a fun kit to work with. 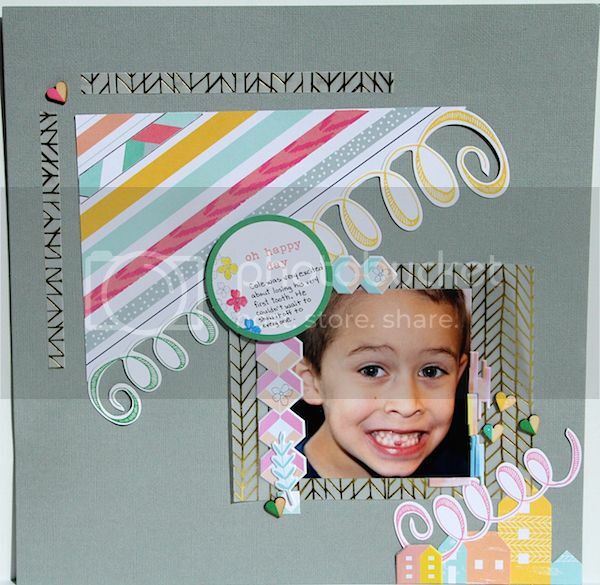 Lots of great colors and geometric designs are included in the patterned paper and the embellishments. Let's get started! The touches of gold on the vellum paper gave this layout a little bit of subtle bling. I accented that pattern with a strip of gold cardstock along the bottom, giving my photos a base to sit on. The black foam thickers are included in the kit, and I like the scripty font! I finished it off with a border penned with a ruler. 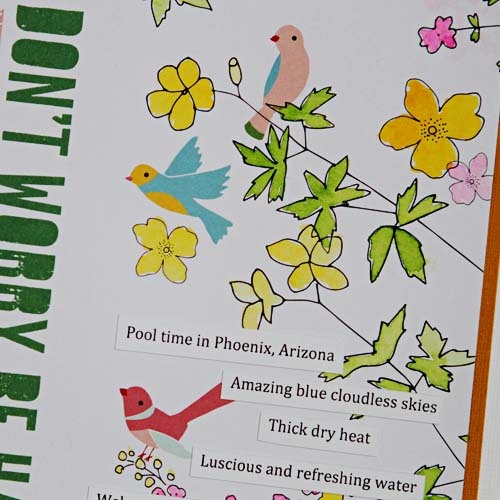 This patterned paper is light and so interesting! To mat my photo, I used a bit of watercolor paint. The puffy stickers accentuate the fun geometric patterns, and the word stickers are appropriate and already had the watercolor effect on them! 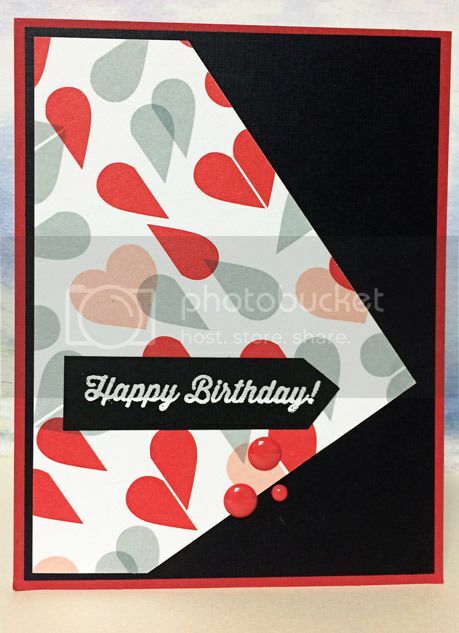 The block of triangles on the patterned paper was perfect to support the photo. A couple of groups of 3 puffy sequins give the layout even more dimension. This layout is a favorite of mine. I think it might be the look in her eye? Again, the patterned paper is light, colorful and fun! I used the banner to mat the photo, and embellished around it with puffy stickers that highlight the elements on the paper. 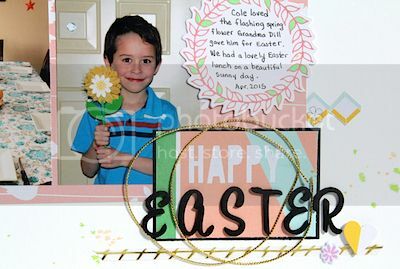 A gold clip gives the photo just a little boost, and the quote sticker is all about how happy spring is! This layout came together quickly. The quotes on the strip of paper are bold and bright, and suited the photo very well. The swirl accents that are included in the Felicity Die Cut package give the title movement and enthusiasm. I really liked the way the patterned paper background had a lot of detail, but because it is mostly outline only, it doesn't overpower the main elements of the design. I placed the title on top of a puffy sticker, using the foam thickers again! This pattern is great for this photo! These 2 are very different kids, but they play and interact really well together, just like the colored blocks and varying tones of this paper. I matted the pic with a dark color and grounded it with a strip of cardstock that used my old faithful "Threading Water" border punch. (Who ever came up with THAT name? Lol!) 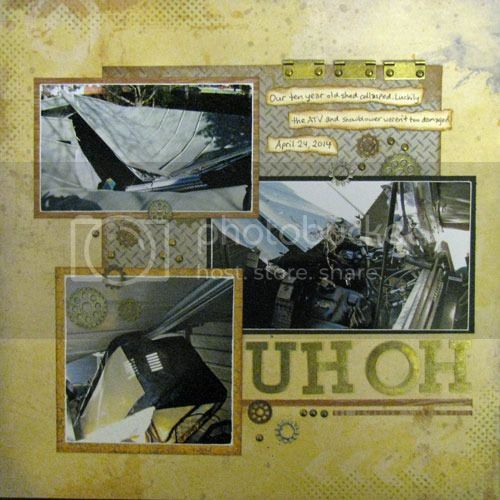 The title was die cut with my new Tim Holtz Marquee alpha thinlits set that I had asked Sandy at Scrapshotz to source for me. She is really awesome about finding specific products. If anyone can find it (at the best price, too!) she can. I finished this layout out by balancing my title with some puffy stickers from the kit and penning a border with a brown pen. With most of our kits, the Design Team chooses a sketch to work with. This month the sketch is from PageMaps. This is my take on the sketch. 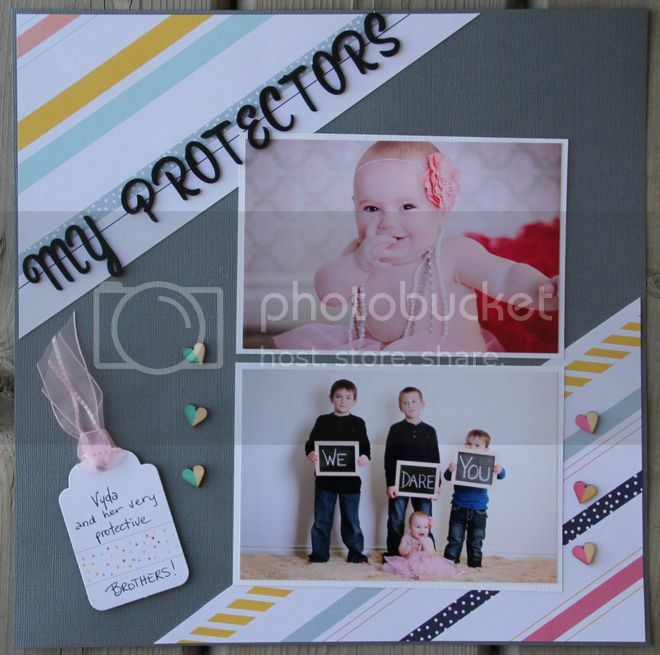 I used the gold vellum for the borders, the photo mat and for the little banners. I added some tulle from my stash for the tag and as a spot of color, By keeping the colors on the layout neutral, the bright colors in the photos really pop! This patterned paper begged to be cut on the diagonal. The pattern and the cutting gives this layout a fun aspect that it wouldn't have had with horizontal lines. The photos are mischievous and cute and the gently falling hearts around the photos highlight the love that they display. What little girl wouldn't love to have 3 big brothers? I'll let you know when she starts dating! Then I used more of those leftovers to make a couple more cards. These ones are matted with different colors, and convey entirely different moods. You have to love a versatile pattern! These cards are also scraps made from the B side of leftovers. The "birds on a wire" remind me of telephone lines, so I thought the sentiment suited. (I probably just aged myself right there. Oops!) I used a Hero Arts Ombre inkpad for the sentiment on it. 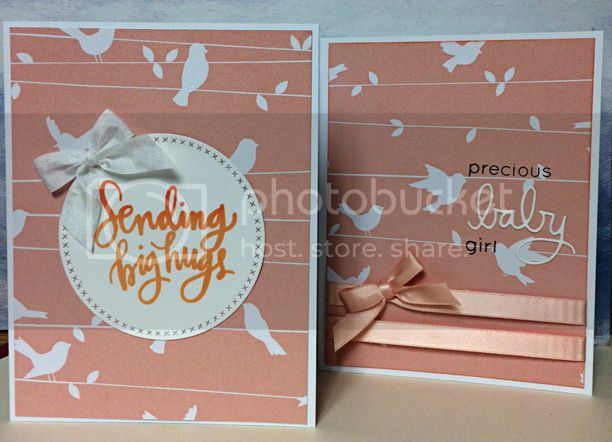 The card in the back is stamped with the the Misti and uses a die cut in the sentiment. 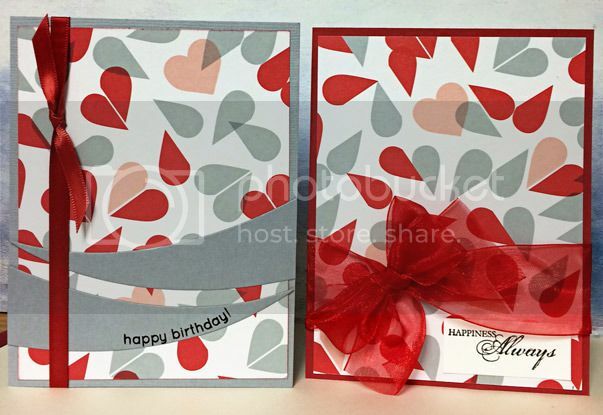 These cards are made from layout scraps as well. 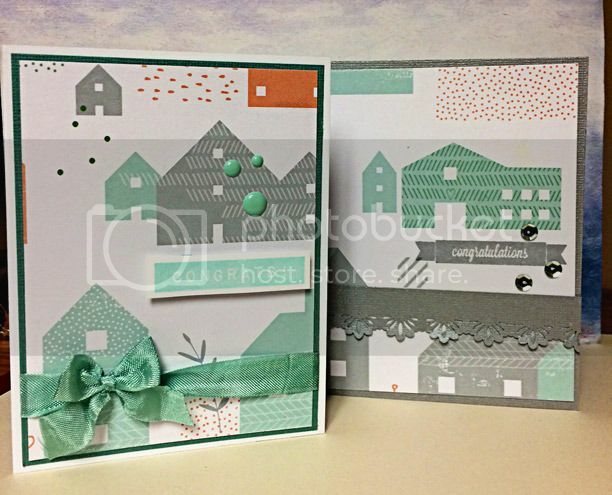 I love the basic shapes and thought the houses would make great "Congratulations on your New Home" cards! One uses enamel dots as accents and the other uses sequins. 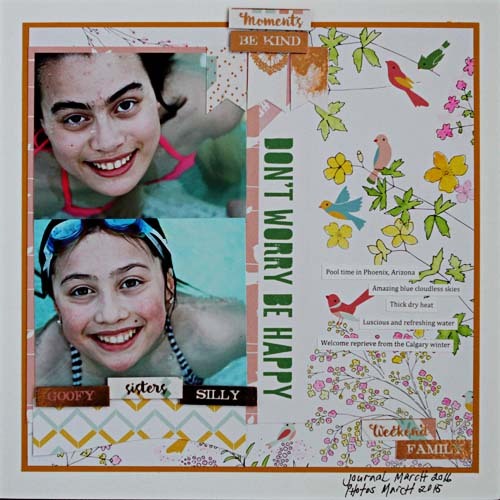 Thanks for having a look at my Scrapshotz March 2016 kit projects. If you have any questions, please just let me know! Have a great day! Hello! Thank you for joining us at Scrap Shotz. We are in the midst of revamping the blog and joining Instagram! The blog is changing to showcase not only the monthly kit club projects but it will also feature interesting techniques, both old and new. You will also find new and exciting product features whether you are a scrapbooker, card maker, home decor crafter or a mixed media artist. We strive to feature something for everyone! 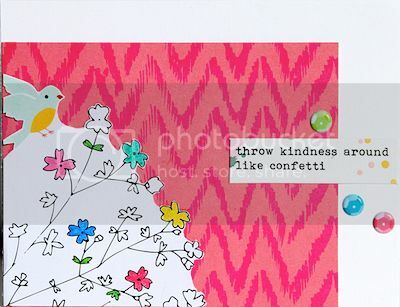 To start things off, I'd love to share the layouts I made using the Pinkfresh Studio, Felicity paper line. 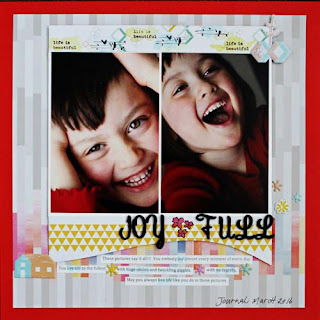 The first layout I created was titled, "Joy Full." Whenever I see these pictures of my daughter, I can't help but smile. From the day she was born, she has always been filled with joy. What fascinates me about this layout is that it was completed from beginning to end in 20 minutes. I saw the pictures; I saw the papers and it was done! 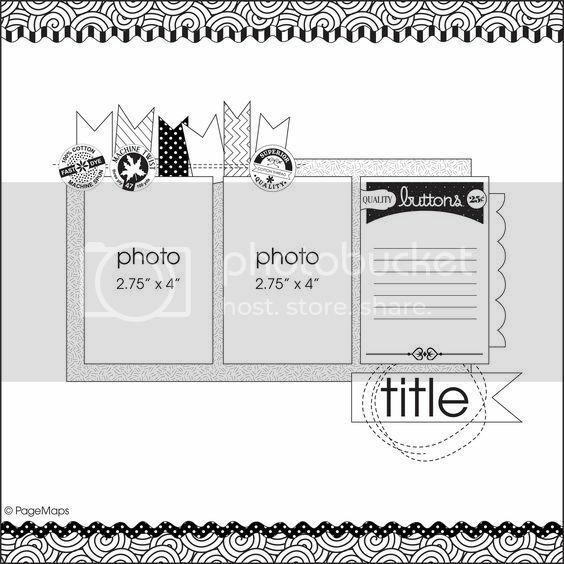 In the header, I used the coordinating Felicity stamp set to augment the geometric patterns. I was in love with the touches of yellow in the pattern paper and decided to add yellow watercolour splashes to the stamping. After I added the yellow, I wanted the complementary watery blue too! The Prima watercolour collection is absolutely wonderful to work with. I am by no means a painter but these water colours and Prima water brushes make it just too easy and so hard to resist. 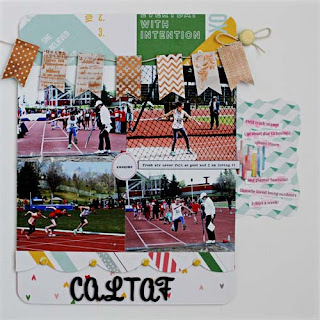 For the "CALTAF" layout, my pictures were somewhat busy and I loved how the peaceful but graphic patterns grounded the photo block. To align with the Track and Field meet flags, I used the Prima Gold Foiled Washi Tape Stickers to create a banner across the header. I added the uber cute Pinkfresh Studios puffy stickers and some Prima Confections watercolours to the journaling. 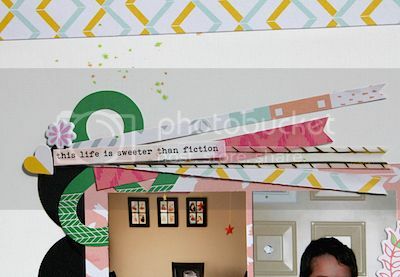 A closeup of the washi tape banner and water coloured journaling can be seen below. 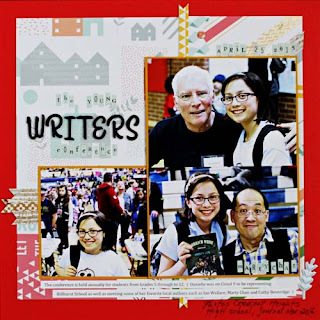 The gold foiled uneven chevron vellum paper really captured my attention. 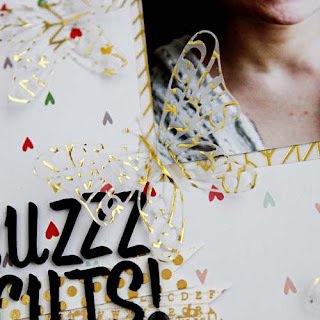 In my opinion, that touch of gold foiling took the paper line from Wow to Wowsers! In the layout below, I used it to highlight my photoblock and then I die cut delicate Elizabeth Craft Design butterflies to dance around the photoblock. The pictures do not do the butterflies justice - sorry! The title is lying on strips of Prima Gold Foiled Washi Tape stickers. 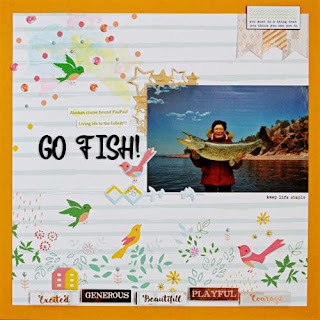 The team was challenged to use the Pinkfresh Studio puffy stickers and sequins. I chose to use the puffy stickers and sequins to augment the pattern in the pattern paper. I added birds and created dimension in the polka dots on the page. I love the effect. And of course, I added some touches of water colour from the Prima watercolour set. You can see a close up of the sequins and watercolours here. In this image, I used the Prima Gold Foiled Washi Tape stickers to create a word block along the bottom of the layout. The words all described my Mom in the photos and grounded my layout. As well, I could not resist the Nuvo glitter drops from Tonic Studios and added that to the flower centres of the pattern paper. The geometric shapes juxtaposed with the natural elements on the pattern paper constantly grabbed my attention. I knew these pieces would be perfect for my beach photos. Of course I could not resist in painting the florals and birds! 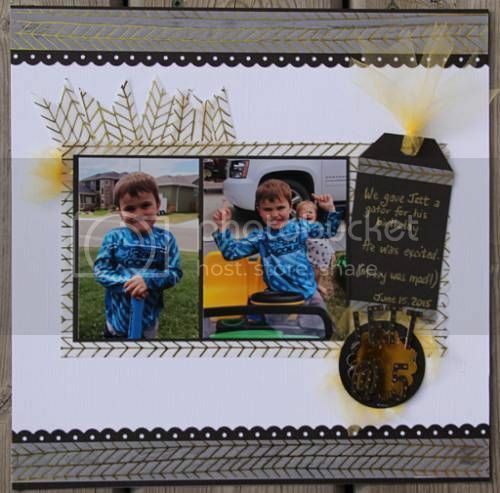 Another word block created from the Prima gold foiled word stickers flanked the photo block. A close up of the water colouring is shown here. 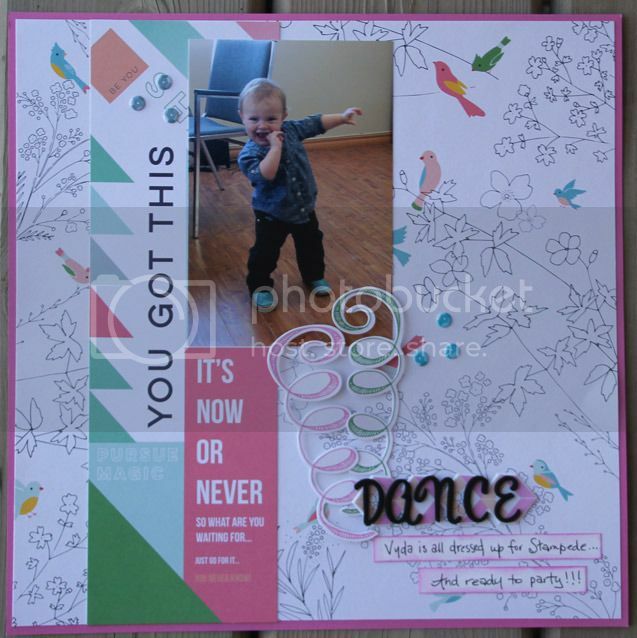 And lastly, with the flip side of my off cuts, I created this fun layout. As I am a paper heavy scrapper, I was feverishly piecing together my leftovers! Thanks for letting me share! I would love to hear and see your Pinkfresh Studios projects. Link me up in the comments!! !